This is a delightful fresh mango salsa recipe. It’s a healthy topping for fish or chicken, great for tacos, or even for scooping up with tortilla chips. You can see from the nutritional values listed below that this heart healthy vegetable and fruit salsa is very low calorie, low fat and fairly low carb, while providing lots of great nutrition. Combine all the salsa ingredients, stirring gently to mix them together well. Makes 3 cups. The mixture can be stored in refrigerator for up to 2 days before using, but it is best freshly made. Make it fresh then store any leftovers (it’s so good you probably won’t have any). 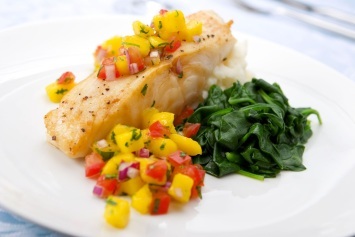 Serve this fruit salsa with grilled fish, chicken or pork. It’s even great with ham. This recipe easily doubles or triples to serve as many as you would like. This fruit salsa is SO good, I think it will quickly become a household favorite. It’s also extremely healthy and fits well into many special diets. If you need gluten free recipes or diabetic recipes, this salsa works well. It is fairly low carb too, but wouldn’t work for the most restricted stages of a low carb Atkins diet. If you like this mango salsa recipe, you may want to try our mango chutney as well. Find it here.